Hooke has been called the English Da Vinci. He is credited with numerous inventions and design improvements of scientific instrumentation. He was a natural philosopher who valued observation and experimentation. He formulated Hooke's Law, a relation that says the force pulling back on a spring is inversely proportional to the distance pulled from rest. Assisted Robert Boyle by constructing his air pump. Hooke designed, improved or invented many scientific instruments used in the Seventeenth Century. Hooke was the first to replace pendulums in clocks with springs. He invented the compound microscope and Gregorian compound telescope. He is credited with the invention of the wheel barometer, hydrometer, and anemometer. He coined the term "cells" for biology. In his studies of paleontology, Hooke believed fossils were living remains that soaked up minerals, leading to petrification. He believed fossils held clues to the nature of the past on Earth and that some fossils were of extinct organisms. At the time, the concept of extinction was not accepted. He worked with Christopher Wren after the London Fire of 1666 as a surveyor and architect. Few of Hooke's buildings survive to the present day. Hooke served as The Royal Society's Curator of Experiments where he was required to perform several demonstrations at each weekly meeting. He held this position for forty years. The Hooke Medal is presented in his honor from the British Society of Cell Biologists. 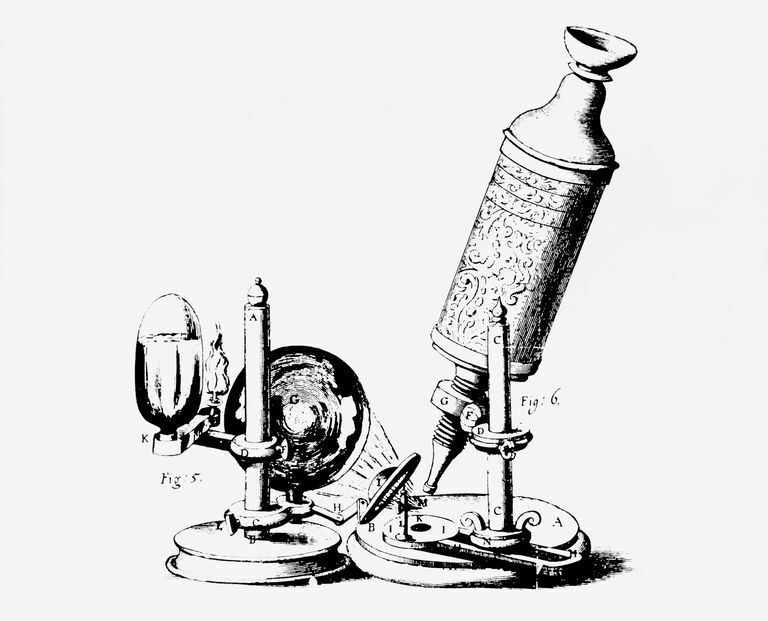 In 1665, Hooke used his primitive compound microscope to examine the structure in a slice of cork. He was able to see the honeycomb structure of cell walls from the plant matter, which was the only remaining tissue since the cells were dead. He coined the word "cell" to describe the tiny compartments he saw. This was a significant discovery because prior to this, no one knew organisms consisted of cells. Hooke's microscope offered a magnification of about 50x. The compound microscope opened up a whole new world to scientists and marked the beginning of the study of cell biology. In 1670, Anton van Leeuwenhoek, a Dutch biologist, first examined living cells using a compound microscope adapted from Hooke's design. Hooke and Isaac Newton were involved in a dispute over the idea of the force of gravity following an inverse square relationship to define the elliptical orbits of planets. Hooke and Newton discussed their ideas in letters to each other. When Newton published his Principia, he did not credit anything to Hooke. When Hooke disputed Newton's claims, Newton denied any wrong. The resulting feud between the leading English scientists of the time would continue until Hooke's death. Newton became President of the Royal Society that same year and many of Hooke's collections and instruments went missing as well as the only known portrait of the man. As President, Newton was responsible for the items entrusted to the Society, but it was never shown he had any involvement in the loss of these items. Craters on the Moon and Mars bear his name. Hooke proposed a mechanistic model of human memory, based on the belief memory was a physical process that occurred in the brain. British historian Allan Chapman refers to Hooke as "England's Leonardo," in reference to his similarity to Leonardo da Vinci as a polymath. There is no authenticated portrait of Robert Hooke. Contemporaries have described him as a lean man of average height, with gray eyes, brown hair. Hooke never married or had children. Chapman, Alan (1996). "England's Leonardo: Robert Hooke (1635–1703) and the art of experiment in Restoration England". Proceedings of the Royal Institution of Great Britain. 67: 239–275. Drake, Ellen Tan (1996). Restless Genius: Robert Hooke and His Earthly Thoughts. Oxford University Press. Robert Hooke. Micrographia. Full text at Project Gutenberg. Robert Hooke (1705). The Posthumous Works of Robert Hooke. Richard Waller, London.